Ubisoft is no stranger to creating breath-taking live action, short film style trailers for their games with Assassins Creed 2 being a perfect example, However, I have to admit, their latest trailer for the upcoming Tom Clancy’s Ghost Recon: Future Soldier title might be one of the best I’ve ever seen. Below is a link to the trailer. Ubisoft will also be making a short film for the Future Soldier in the same style, however the trailer below is a not a clip from it rather a trailer for the game itself. 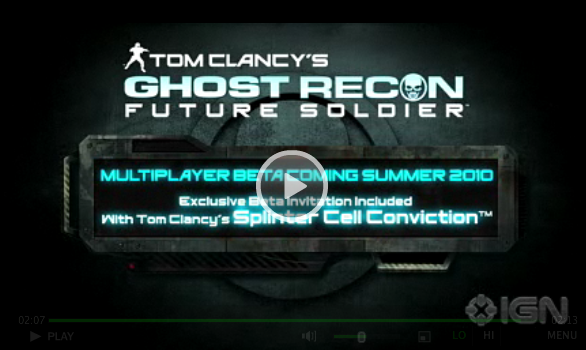 The trailer also announces a multiplayer beta coming in the summer of 2010, with invitations going out to those who purchase Tom Clancy’s Splinter Cell Conviction. Enjoy.